The 2nd to the 5th of September is the 345th anniversary of the Great Fire of London of 1666. A midland GP and author, interested by the subject, has written a novel set during it. A paperback edition of the historical fantasy novel, The Last Seal has just been published this summer along with a Kindle version. 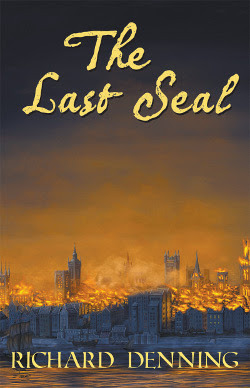 Aimed at fantasy fans and those who enjoy historical novels, The Last Seal recreates this great event but adds a fantasy twist. When researching the subject, the author found that this was a period of widespread paranoia about foreign plots and conspiracies, and a time when people believed in witchcraft, omens, magic and superstition. All of that suggested a story where the fire was not just an accident. Denning's novel involves secret societies and a supernatural explanation behind the fire. Richard Denning (44) was born in Ilkeston in Derbyshire and lives in Sutton Coldfield in the West Midlands where he works as a General Practitioner with a North Birmingham practice. He is also a Young adult sci-fi, historical fiction and historical fantasy writer. The Great Fire of London has fascinated Richard for many years. In the last year he has published a board game based around the Great Fire as well as a historical fantasy set during it. Stephanie Williams, editor, Rebel Books.